Gary Ward, associate vice chancellor, Campus Facilities, oversees the MU Power Plant, which was recognized recently by the EPA. COLUMBIA, Mo. ­— It has burned corncobs, used tires, waste wood and switchgrass, all in an effort to keep people comfortable. With a capacity of producing up to 66 megawatts of electricity and 1.1 million pounds of steam per hour, the University of Missouri’s Power Plant is responsible for supplying energy and cooling and heating for buildings that total more than 13 million square feet, including three hospitals, the research reactor and several research facilities. Recently, the U.S. Environmental Protection Agency (EPA) recognized the power plant with a 2010 EPA Energy Star Combined Heat and Power (CHP) award recipient, making it one of only three universities in the nation recently recognized with the honor. The award from the EPA recognized those power plants that produced energy efficiently while decreasing air pollution. MU’s operating efficiency is more than 70 percent, compared to conventional fossil-fueled power plants, which are only about 30 percent efficient, according to the EPA. Other universities recognized at this time were the University of California in San Diego and Fairfield University, located in Fairfield, Conn.
MU has been producing heat and electricity using CHP since 1892. MU’s CHP system uses nearly 38 percent less fuel than typical systems using onsite thermal generation with purchased electricity. MU’s CHP system also reduces CO2 emissions by an estimated 107,000 tons per year. This reduction is equivalent to the annual emissions from more than 17,900 passenger vehicles. MU is recognized nationally as a leader in energy efficiency and conservation, reducing energy usage by 10 percent per square foot and greenhouse gas emissions by 12 percent per square foot since 1990. 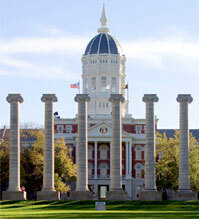 Over the past 20 years, MU has saved an average of $6.6 million annually. Other awards include the 2008 Energy Efficiency award from the National Wildlife Federation, 2004 International District Energy Association’s System of the Year award, and 2001 Energy Star Partner of the Year award. Power Plant staff work directly with researchers to search for alternative fuels and more efficient means to heat, cool and power the campus. Currently, MU’s forestry department is helping develop specifications for fuel for the biomass boiler to ensure the health and value of Missouri’s forests, while other forestry faculty are exploring the feasibility of growing woody biomass to utilize in the power plant.